This article is about car manufacturer. For bicycle manufacturer, see Cycles Peugeot. Groupe PSA is a French multinational manufacturer of automobiles and motorcycles sold under the Peugeot, Citroën, DS, Opel and Vauxhall brands. Peugeot is the largest PSA brand in Europe and in the world. PSA is listed on the Euronext Paris stock exchange and is again a constituent of the CAC 40 index (2015) after having been removed in 2012. The family business that preceded the current Peugeot company was founded in 1810 under Napoleon's Empire,  and manufactured coffee mills and bicycles. On 20 November 1858, Émile Peugeot applied for the lion trademark. Armand Peugeot built the company's first car, an unreliable steam tricycle, in collaboration with Léon Serpollet in 1889; this was followed in 1890 by an internal combustion car with a Panhard-Daimler engine. Due to family discord, Armand Peugeot founded the Société des Automobiles Peugeot, in 1896. A burr mill, or burr grinder, is a mill used to grind hard, small food products between two revolving abrasive surfaces separated by a distance usually set by the user. When the two surfaces are set far apart, the resulting ground material is coarser, and when the two surfaces are set closer together, the resulting ground material is finer and smaller. Often, the device includes a revolving screw that pushes the food through. It may be powered electrically or manually. Sochaux is a commune in the Doubs department in the Bourgogne-Franche-Comté region in eastern France. The Musée de l'Aventure Peugeot is a historical museum devoted to the Peugeot automobile business. The museum was founded by members of the Peugeot family, opening in 1988 across the road from the company’s huge industrial site at Sochaux. The European Car of the Year award is an international award established in 1964, by a collective of automobile magazines from different countries in Europe. The current organisers of the award are Auto (Italy), Autocar, Autopista (Spain), Autovisie (Netherlands), L'Automobile Magazine (France), Stern (Germany) and Vi Bilägare (Sweden). The World Rally Championship (WRC) is a rallying series organised by the FIA, culminating with a champion driver, co-driver and manufacturer. The driver's world championship and manufacturer's world championship are separate championships, but based on the same point system. The series currently consists of 14 three-day events driven on surfaces ranging from gravel and tarmac to snow and ice. Each rally is split into 15–25 special stages which are run against the clock on closed roads. The Dakar Rally is an annual rally raid organised by the Amaury Sport Organisation. Most events since the inception in 1978 were from Paris, France, to Dakar, Senegal, but due to security threats in Mauritania, which led to the cancellation of the 2008 rally, races since 2009 have been held in South America. The race is open to amateur and professional entries, amateurs typically making up about eighty percent of the participants. The Peugeot family of Valentigney, Montbéliard, Franche-Comté, France, began in the manufacturing business in the 19th century. In 1842, they added production of coffee, pepper, and salt grinders. The company's entry into the vehicle market was by means of crinoline dresses, which used steel rods, leading to umbrella frames, saw blades, chisels, wire wheels, and bicycles. Armand Peugeot introduced his "Le Grand Bi" penny-farthing in 1882, along with a range of other bicycles. The company's logo, initially a lion walking on an arrow, symbolized the speed, strength and flexibility of the Peugeot saw blades. The car company and bike company parted ways in 1926 but Peugeot bicycles continued to be built until very recently. Valentigney is a commune in the Doubs department in the Bourgogne-Franche-Comté region in eastern France. The arrondissement of Montbéliard is an arrondissement of France in the Doubs department in the Bourgogne-Franche-Comté region. In 2009 the canton of Russey that previously belonged to the arrondissement of Montbéliard was added to the arrondissement of Pontarlier. It has 168 communes. Franche-Comté is a cultural and historical region of eastern France. It is composed of the modern departments of Doubs, Jura, Haute-Saône and the Territoire de Belfort. In 2016, its population was 1,180,397. Peugeot was an early pioneer in motor racing, with Albert Lemaître winning the world's first motor race, the Paris–Rouen, in a 3 hp Peugeot. Five Peugeots qualified for the main event, and all finished. Lemaître finished 3 min 30 sec behind the Comte de Dion whose steam-powered car was ineligible for the official competition. Three Peugeots were entered in the Paris–Bordeaux–Paris, where they were beaten by Panhard's car  (despite an average speed of 20.8 km/h (12.9 mph)  and taking the 31,500 franc prize. This also marked the debut of Michelin pneumatic tyres in racing,  also on a Peugeot; they proved insufficiently durable. Nevertheless, the vehicles were still very much horseless carriages in appearance and were steered by a tiller. In 1896, the first Peugeot engines were built; no longer were they reliant on Daimler. Designed by Rigoulot, the first engine was an 8 hp (6.0 kW) horizontal twin fitted to the back of the Type 15. It also served as the basis of a nearly exact copy produced by Rochet-Schneider. Further improvements followed: the engine moved to the front on the Type 48 and was soon under a bonnet at the front of the car, instead of hidden underneath; the steering wheel was adopted on the Type 36; and they began to look more like the modern car. A more famous name, Ettore Bugatti, designed the new 850 cc (52 cu in) four-cylinder Bébé of 1912. The same year, Peugeot returned to racing with a team of three driver-engineers (a breed typical of the pioneer period, exemplified by Enzo Ferrari among others): Jules Goux (graduate of Arts et Metiers, Paris), Paolo Zuccarelli (formerly of Hispano-Suiza), and Georges Boillot (collectively called Les Charlatans), with 26-year-old Swiss engineer Ernest Henry to make their ideas reality. The company decided voiturette (light car) racing was not enough, and chose to try grandes épreuves (grand touring). They did so with an engineering tour de force: a dual overhead camshaft (DOHC) 7.6-liter four-cylinder (110x200 mm) with four valves per cylinder. It proved faster than other cars of its time, and Boillot won the 1912 French Grand Prix at an average of 68.45 mph (110.2 km/h), despite losing third gear and taking a 20-minute pit stop. In May 1913, Goux took one to Indianapolis, and won at an average of 75.92 mph (122.2 km/h), recording straightaway speeds of 93.5 mph (150.5 km/h). making Peugeot the first non-American-based auto company to win at the Indianapolis Motor Speedway. In 1914, Boillot's 3-liter L5 set a new Indy lap record of 99.5 mph (160.1 km/h), and Duray placed second (beaten by ex-Peugeot ace René Thomas in a 6,235 cc (380 cu in) Delage). Another (driven by Boillot's brother, André) placed in 1915; similar models won in 1916 (Dario Resta) and 1919 (Howdy Wilcox). During the First World War, Peugeot turned largely to arms production, becoming a major manufacturer of arms and military vehicles, from armoured cars and bicycles to shells. Paris-Rouen 1894. Albert Lemaître (pictured on left) was classified 1st in his Peugeot 3 hp. Bicycle manufacturer Adolphe Clément-Bayard was the front passenger. During the 1920s, Peugeot expanded, in 1926 splitting the cycle (pedal and motor) business off to form Cycles Peugeot, the consistently profitable cycle division seeking to free itself from the rather more cyclical auto business, and taking over the defunct Bellanger and De Dion companies in 1927. In 1928, the Type 183 was introduced. New for 1929 was the Peugeot 201, the cheapest car on the French market,  and the first to use the later Peugeot trademark (and registered as such)—three digits with a central zero. The 201 would get independent front suspension in 1931,  Soon afterwards, the Depression hit; Peugeot sales decreased, but the company survived. The Peugeot system of using three digit names with a central 0 was introduced in 1929. The first digit has always signified the car's size and the final digit has indicated the generation of vehicle. In 1933, attempting a revival of fortune, the company unveiled a new, aerodynamically styled range. In 1934, Peugeot introduced the 402 BL Éclipse Décapotable, the first convertible with a retractable hardtop    — an idea followed later by the Ford Skyliner in the 1950s and revived in the modern era by the Mitsubishi 3000GT Spyder in 1995. More recently, many manufacturers have offered retractable hardtops, including Peugeot itself with the 206-cc. Three models of the 1930s were the Peugeot 202, Peugeot 302, and Peugeot 402. These cars had curvaceous designs, with headlights behind sloping grille bars, evidently inspired by the Chrysler Airflow. The 2.1-liter  402 entered production in 1935 and was produced until the end of 1941, despite France's occupation by the Nazis. For 1936, the new Airflow-inspired 302 (which ran until 1938) and a 402-based large model, designed by Andrean, featured a vertical fin and bumper, with the first high-mounted taillight. The entry-level 202 was built in series from 1938 to 1942, and about 20 more examples were built from existing stocks of supplies in February 1945. The 202 lifted Peugeot's sales in 1939 to 52,796, just behind Citroën. Regular production began again in mid-1946, and lasted into 1949. Peugeot took over Chenard-Walcker in 1950, having already been required to acquire a controlling interest in Hotchkiss in 1942. A popular model introduced in 1955 was the Peugeot 403. With a 1.5-liter engine, it sold one million copies by the end of its production run in 1962, famously including one cabriolet/convertible driven by TV detective Columbo. The company began selling cars in the United States in 1958, and in 1960 introduced the Peugeot 404, which used a 1,618 cc (99 cu in) engine, tilted 45°. The 404 proved rugged enough to win the East African Safari Rally four times, in 1963, 1966, 1967, and 1968. Peugeot 403, the sedan version of the cabriolet driven by the American TV detective Columbo. The Peugeot 204 was the manufacturer's first front wheel drive model and the best selling car in France in 1969, 1970 and 1971. In 1974, Peugeot bought a 30% share of Citroën, and took it over completely in 1975 after the French government gave large sums of money to the new company. Citroën was in financial trouble because it developed too many radical new models for its financial resources. Some of them, notably the Citroën SM and the Comotor Wankel engine venture proved unprofitable. Others, the Citroën CX and Citroën GS for example, proved very successful in the marketplace. The joint parent company became the PSA (Peugeot Société Anonyme) group, which aimed to keep separate identities for both the Peugeot and Citroën brands, while sharing engineering and technical resources. Peugeot thus briefly controlled the Italian Maserati marque, but disposed of it in May 1975. As part of the Guangzhou Peugeot Automobile Company (GPAC) joint venture, the Peugeot 504 and 505 were built in China from 1985 to 1997. By 1987, the company had dropped the Talbot brand for passenger cars when it ceased production of the Simca-based Horizon, Alpine, and Solara models, as well as the Talbot Samba supermini which was based on the Peugeot 104. What was to be called the Talbot Arizona became the Peugeot 309, with the former Rootes plant in Ryton and Simca plant in Poissy being turned over for Peugeot assembly. Producing Peugeots in Ryton was significant, as it signalled the first time Peugeots would be built in Britain. The 309 was the first Peugeot-badged hatchback of its size, and sold well across Europe. The 309's successor, the 306, was also built at Ryton. The 405 saloon was launched in 1987 to compete with the likes of the Ford Sierra, and was voted European Car of the Year. This, too, was a very popular car across Europe, and continued to be available in Africa and Asia after it was replaced by the 406 nearly a decade later. Production of the 405 in Europe was divided between Britain and France, although its 406 successor was only produced in France. The 106, Peugeot's entry-level model from 1991, was also produced solely in France. The Talbot name survived for a little longer on commercial vehicles until 1992 before being shelved completely. As experienced by other European volume car makers, Peugeot's United States and Canadian sales faltered and finally became uneconomical, as the Peugeot 505 design aged. For a time, distribution in the Canadian market was handled by Chrysler. Several ideas to turn around sales in the United States, such as including the Peugeot 205 in its lineup, were considered but not pursued. In the early 1990s, the newly introduced 405 proved uncompetitive with domestic and import models in the same market segment, and sold less than 1,000 units. Total sales fell to 4,261 units in 1990 and 2,240 through July 1991, which caused the company to cease its U.S. and Canada operations after 33 years. In 1997, just six years after pulling out of both United States and Canadian markets, Peugeot returned to Mexico after a 36-year absence, under the Chile–Mexico Free Trade Agreement. However Peugeot models (1992–present) cannot be bought or imported into the United States from Mexico. On 18 April 2006, PSA Peugeot Citroën announced the closure of the Ryton manufacturing facility in Coventry, England. This announcement resulted in the loss of 2,300 jobs, as well as about 5,000 jobs in the supply chain. The plant produced its last Peugeot 206 on 12 December 2006, and finally closed down in January 2007. Peugeot S.A. has produced four "Car of the Year Auto Europa" award winners in Italy in 28 years, since 1987. "Auto Europa" is the prize awarded by the jury of the Italian Union of Automotive Journalists (UIGA), which annually celebrates the best car produced at least at 10,000 units in the 27 countries of the European Union, and sold between September and August the previous year. Peugeot was involved in motorsport from the earliest days and entered five cars for the Paris-Rouen Trials in 1894 with one of them, driven by Lemaître, finishing second. These trials are usually regarded as the first motor sporting competition. Participation in a variety of events continued until World War I, but in 1912, Peugeot made its most notable contribution to motor sporting history when one of their cars, driven by Georges Boillot, won the French Grand Prix at Dieppe. This revolutionary car was powered by a straight-4 engine designed by Ernest Henry under the guidance of the technically knowledgeable racing drivers Paul Zuccarelli and Georges Boillot. The design was very influential for racing engines as it featured for the first time DOHC and four valves per cylinder, providing for high engine speeds, a radical departure from previous racing engines which relied on huge displacement for power. In 1913, Peugeots of similar design to the 1912 Grand Prix car won the French Grand Prix at Amiens and the Indianapolis 500. When one of the Peugeot racers remained in the United States during World War I and parts could not be acquired from France for the 1914 season, owner Bob Burman had it serviced in the shop of Harry Miller by a young mechanic named Fred Offenhauser. Their familiarity with the Peugeot engine was the basis of the famed Miller racing engine, which later developed into the Offenhauser. Peugeot Sport is one of the most successful winners in rallying, along with Citroën Racing (eight-time WRC winner), by winning five times the World Rally Championship Manufacturer's Title (1985-1986, 2000-2002), six times the Dakar Rally (1987-1990, 2016-2017), three times the European Rally Championship (2002-2003, 2008), three times the Intercontinental Rally Challenge (2007-2009). Peugeot's East Africa n importers had a very impressive record in rallying in the 1960s; Nick Nowicki and Paddy Cliff won the East African Safari in 1963 with a Marshall's-entered 404 sedan. In 1966 and 1967, Tanzania's Tanganyika Motors entered the winning 404 Injection sedan, piloted by the late Bert Shanlkand and Chris Rothwell. They might have won again in 1968, but while in second place, their engine blew and ultimately Nick Nowicki and Paddy Cliff upheld Peugeot's honour by winning the rally. Peugeot also won the Safari Rally in 1975 (Andersson in a 504 Injection sedan) and in 1978 (Nicolas in a 504 Coupé V6), both cars being factory team entries. Peugeot also had further success in international rallying, most notably in the World Rally Championship with the four-wheel-drive turbo-charged versions of the Peugeot 205, and more recently the Peugeot 206. In 1981, Jean Todt, former co-driver for Hannu Mikkola, Timo Mäkinen, and Guy Fréquelin, among others, was asked by Jean Boillot, the head of Automobiles Peugeot, to create a competition department for PSA Peugeot Citroën. The resulting Peugeot Talbot Sport, established at Bois de Boulogne near Paris,  debuted its Group B 205 Turbo 16 at the 1984 Tour de Corse in May, and took its first world rally win that same year at the 1000 Lakes Rally in August, in the hands of Ari Vatanen. Excluding an endurance rally where Peugeot were not participating, Vatanen went on win five world rallies in a row. In 1999, Peugeot returned to the World Rally Championship with the 206 WRC. The car was immediately competitive against such opposition as the Subaru Impreza WRC, the Ford Focus WRC, and the Mitsubishi Lancer Evolution. Marcus Grönholm gave the car its first win at the 2000 Swedish Rally, and Peugeot went on to win the manufacturers' title in their first full year since the return, and Grönholm the drivers' title in his first full WRC season. After successfully but narrowly defending their manufacturers' title in 2001, Peugeot Sport dominated the 2002 season, taking eight wins in the hands of Grönholm and Gilles Panizzi. Grönholm also took the drivers' title. For the 2004 season, Peugeot retired the 206 WRC in favour of the new 307 WRC. The 307 WRC did not match its predecessor in success, but Grönholm took three wins with the car, one in 2004 and two in 2005. PSA Peugeot Citroën withdrew Peugeot from the WRC after the 2005 season, while Citroën took a sabbatical year in 2006 and returned for the next season. Meanwhile, Gronholm departed Peugeot when they quit at the end of 2005 to partner young compatriot Mikko Hirvonen at Ford. Peugeot 207 S2000, winner of the Intercontinental Rally Challenge from 2007 to 2009. Peugeot won five times the Danish Touringcar Championship, with both the Peugeot 306 -winner in 1999, 2000 and 2001- and the Peugeot 307 winner in 2002 and 2003. With his Peugeot 406, Laurent Aiello won the 1997 Super Tourenwagen Cup season. Throughout the mid-1990s, the Peugeot 406 saloon (called a sedan in some countries) contested touring car championships across the world, enjoying success in France, Germany and Australia, yet failing to win a single race in the British Touring Car Championship despite a number of podium finishes under the command of 1992 British Touring Car Champion Tim Harvey. In Gran Turismo 2 the 406 saloon description sums its racing career up as "a competitive touring car which raced throughout Europe". Initially the 406's lack of success was blamed on suspension problems. During 1998 the 406 apparently lacked sufficient horsepower to compete with the front runners' Nissan Primeras and Honda Accords; this was mentioned during a particularly strong showing from Harvey's 406 at the Oulton Park BTCC meeting of 1998, when motorsport commentator Charlie Cox stated "some people say (the 406) is down on power – you're kidding". During the first BTCC meeting at Silverstone in the same year, Cox mentions that MSD re-designed the 406 touring car "from the ground up". It was however widely reported in publications like the now-defunct 'Super Touring' magazine that it was the aero package primarily developed for longer, faster tracks in Germany and France that led to its success there, but hindered the 406 on the slower, twistier tracks of the UK. In 2001, Peugeot entered three BTC-T Peugeot 406 Coupés into the British Touring Car Championship to compete with the dominant Vauxhall Astra coupes. Unfortunately the 406 coupe was at the end of its product lifecycle and was not competitive, despite some promise towards the end of the year, notably when Peugeot's Steve Soper led a race only to suffer engine failure in the last few laps. The 406 coupes were retired at the end of the following year and replaced with the Peugeot 307—again, uncompetitively—in 2003. Alongside the BTC-C 406's; two works-supported 306 GTis were also raced in the BTC-P (Production) class by Simon Harrison and Roger Moen, with Harrison emerging class champion. In the 1990s the company competed in endurance racing, including the World Sportscar Championship and the 24 Hours of Le Mans race with the 905. The sportscar team was established at Vélizy-Villacoublay, France. After early problems with reliability and aerodynamics, the 905 was successful in the World Sportscar Championship, winning eight of the 14 races across the 1991 and 1992 seasons and winning the team and driver titles in 1992. Peugeot also won the 24 Hours of Le Mans in 1992 and 1993. Peugeot returned to sportscar racing and Le Mans in 2007 with the diesel-powered Peugeot 908 HDi FAP. At the 2007 24 Hours of Le Mans, Stéphane Sarrazin secured pole position but the 908s proved unreliable and ceded victory to Audi. In 2008, Sarrazin earned a pole position but Audi prevailed once again. For the 2009 24 Hours of Le Mans, the Peugeot 908 HDi FAPs finished first and second overall, led by drivers Marc Gené, David Brabham, and Alexander Wurz. The company has also been involved in providing engines to Formula One teams, notably to McLaren in 1994, to Jordan for the 1995, 1996 and 1997 seasons, and to Prost for the 1998, 1999 and 2000 seasons. The manufacturer did not score any victories, and their F1 interests were sold to Asiatech at the end of the 2000 season. Peugeot Motocycles company remains a major producer of scooters, underbones, mopeds, and bicycles in Europe. Peugeot produced an electric motor scooter, the Peugeot Scoot'Elec, from 1996 to 2006, and is projected to re-enter the market in 2011 with the E-Vivacity. Citroën is a French automobile manufacturer, part of the PSA Peugeot Citroën group since 1976, founded in 1919 by French industrialist André-Gustave Citroën (1878–1935). In 1934, the firm established its reputation for innovative technology with the Traction Avant. This car was the world's first mass-produced front wheel drive car, and also one of the first to feature a unitary type body, with no chassis supporting the mechanical components. The Citroën ZX is a small family car produced by the French manufacturer Citroën between 1991 and 1998. 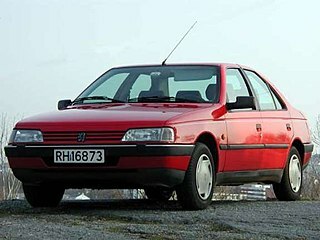 The Peugeot 405 is a large family car released by the French automaker Peugeot in July 1987, and which continues to be manufactured under licence outside France, having been discontinued in Europe in 1997. It was voted European Car of the Year for 1988 by the largest number of votes in the history of the contest. About 2.5 million vehicles have been sold worldwide, both in LHD and RHD, as a sedan and station wagon. Talbot or Clément-Talbot Limited was a London automobile manufacturer founded in 1903. Clément-Talbot's products were named just Talbot from shortly after introduction, but the business remained Clément-Talbot Limited until 1938 when it was renamed Sunbeam-Talbot Limited. The founders, Charles Chetwynd-Talbot, 20th Earl of Shrewsbury and Adolphe Clément-Bayard, reduced their financial interests in their Clément-Talbot business during the First World War. The Peugeot 307 is a small family car produced by the French manufacturer Peugeot since 2001, following the Peugeot 306 which ceased production in 2002. It was awarded the European Car of the Year title for 2002, and continued to be offered in China and certain South American markets through 2014, despite the French launch of the 308 in September 2007. The Peugeot 206 is a supermini car (B) that is produced by the French manufacturer Peugeot from May 1998 to the present day. The car remains in production in Iran by Iran Khodro. The Peugeot 407 is a large family car produced by the French automaker Peugeot from 2003 to 2010. It is available in saloon, coupé and estate variants, with both diesel and petrol engines. The petrol engines range from 1.8 to 2.9 litres displacement, whereas the diesels range from 1.6 to 3.0 litre engines. The 407, along with the larger 607, was succeeded by the 508 in January 2011. The Citroën C4 is a compact car produced by French automaker Citroën since Autumn 2004. It is currently in its second generation. The Citroën Elysée is a small family saloon car produced for the Chinese domestic market by the Dongfeng Peugeot-Citroën Automobile, a joint venture between the French PSA Group (Peugeot-Citroën) and the Chinese manufacturer Dongfeng Motor. Production commenced in June 2002. The Peugeot 207 was a supermini produced by the French automaker Peugeot from 2006 to 2014. It was unveiled in January 2006, and launched in April 2006. The 207 replaced the 206 in April 2006, then it was replaced by the Peugeot 208 in April 2012. Dongfeng Peugeot-Citroën Automobile Co., Ltd. (DPCA) is a joint venture between Dongfeng Motor Group and PSA Peugeot Citroën. Based in Wuhan, capital of Hubei province, it manufactures Peugeot and Citroën models for sale in China. The Fukang was the first in a range of cars produced for the Chinese market by the Dongfeng Peugeot-Citroën Automobile group, a joint venture between the French PSA Peugeot Citroën and a Chinese manufacturer Dongfeng. The Peugeot 208 is a supermini produced by the French automaker Peugeot, and unveiled at the Geneva Motor Show in March 2012. The first 208 models were three door hatchbacks produced in 2011, at the company's new plant in Slovakia. In June 2012, as five door hatchbacks became available, production of the 208 also commenced at Peugeot's French plants at Mulhouse and at Poissy. The Peugeot 2008 is a subcompact crossover SUV produced by the French manufacturer Peugeot since 2013. The 2008 replaced the Peugeot 207 SW, as Peugeot did not plan to release an SW version of its 208. It was developed under code name "A94" and is based on the PF1 platform, sharing electronic components with Peugeot 208. The DS 3 is a supermini, produced by the French manufacturer Citroën since 2009 and officially launched in January 2010. This was the first car in the new DS range from Citroën. Its design was inspired by the concept car Citroën DS Inside. France was a pioneer in the automotive industry and is the 11th-largest automobile manufacturer in the world by 2015 unit production and the third-largest in Europe. It had consistently been the 4th-largest from the end of World War II up to 2000. The FIA 2-Litre World Rally Cup was a sub-section of the World Rally Championship from 1993 to 1999. It involved mostly 1,600 cc (97.6 cu in) or 2,000 cc (122.0 cu in), naturally aspirated, front wheel drive cars. The series was discontinued due to high costs, and the new Super 2000 class was amalgamated into the Production World Rally Championship, whilst the 1600cc cars were generally modified for usage in the Super 1600 class, which formed the basis of the Junior World Rally Championship in 2001. The most successful manufacturer was SEAT, who won the title three times in a row with their SEAT Ibiza Kit Car. ↑ "Registration document" (PDF). PSA Peugeot Citroën. 2010. p. 90. Archived from the original (PDF) on 7 August 2011. Retrieved 5 January 2012. ↑ "For the fifth year in a row, the Peugeot RCZ has been awarded the Diesel Car magazine 'Sports Car of the Year'". Western Morning News. 17 May 2013. Archived from the original on 10 August 2014. Retrieved 6 August 2014. ↑ "Top Gear 2010 Awards". Topgear.com. Archived from the original on 28 May 2011. Retrieved 24 June 2011. ↑ "World ranking of manufacturers" (PDF). oica.net. Archived (PDF) from the original on 12 June 2010. Retrieved 22 February 2010. ↑ "History of the Peugeot family, pioneers of the french industry". www.peugeot.com. Archived from the original on 5 June 2017. Retrieved 1 May 2018. ↑ Darke, Paul. "Peugeot: The Oldest of Them All", in Ward, Ian, executive editor. World of Automobiles (London: Orbis, 1974), Volume 15, p.1683. 1 2 "Dongfeng, French Government to Invest in Peugeot". TIME. Archived from the original on 19 February 2014. Retrieved 19 February 2014. 1 2 ""Chinese Firm and France to Buy Stakes in Peugeot" 18 February 2014". Archived from the original on 11 November 2014. Retrieved 14 September 2014. 1 2 "After two centuries, Peugeot family cedes control". 19 February 2014. Archived from the original on 11 November 2014. Retrieved 14 September 2014. ↑ "Renault climbs two places to claim the lowest average CO2 emissions among volume brands in Europe at 110.1g/km" (PDF). JATO. JATO. 4 March 2014. Archived (PDF) from the original on 27 December 2015. Retrieved 30 January 2015. ↑ Michael Edward. "Peugeot surviving Africa". Archived from the original on 27 December 2015. Retrieved 30 April 2015. ↑ "Archived copy". Archived from the original on 14 November 2017. Retrieved 5 April 2018. CS1 maint: Archived copy as title (link) "Sébastien Loeb and Peugeot Pikes Peak smash record". ↑ Georgano, G. N. Cars: Early and Vintage, 1886-1930. (London: Grange-Universal, 1985), p.22. ↑ Darke, Paul. "Peugeot: The Oldest of them All", in Northey, Tom, ed. The World of Automobiles (London: Orbis Publishing, 1974), Volume 15, p.1682. ↑ "Peugeot launches a desktop sculpture of its new brand ambassador". Peugeot. 27 September 2018. Retrieved 11 January 2019. ↑ Darke, p.1684. The Panhards were disqualified for being two-seaters. Georgano, p.22. 1 2 3 4 5 6 Darke, p.1684. 1 2 3 4 5 Darke, p.1685. ↑ Darke, p.1686 & 1688. 1 2 3 Darke, p.1688. 1 2 3 Darke, p.1689. 1 2 3 4 5 6 7 8 Darke, p.1690. 1 2 3 4 "Automobilia". Toutes les voitures françaises 1932 (salon [Paris, Oct] 1931). Paris: Histoire & collections. Nr. 80s: Page 74. 2006. 1 2 Odin, L.C. World in Motion 1939, The whole of the year's automobile production. Belvedere Publishing, 2015. ASIN: B00ZLN91ZG. ↑ "Disappearing Top On Auto Worked By Push Button". Popular Mechanics. Vol. 63 no. 2. February 1935. p. 253. ↑ "Latest Foreign Auto Has Disappearing Top". Popular Mechanics. Vol. 65 no. 1. January 1936. p. 43. 1 2 3 4 5 Darke, p.1693. 1 2 3 4 Darke, p.1694. ↑ "Austin Rover Online". Aronline.co.uk. Archived from the original on 18 July 2012. Retrieved 2 May 2011. ↑ Baggott, James (10 June 2009). "Sales Legends: Peugeot 205". Car Dealer Magazine. Archived from the original on 26 April 2012. Retrieved 3 January 2012. ↑ "Peugeot marks re-entry into India - News". Autocar India. 3 November 2011. Archived from the original on 7 December 2011. Retrieved 28 November 2011. ↑ "Peugeot returns to the Philippines under the Alvarez group - Inquirer Business". 23 October 2012. Archived from the original on 14 September 2014. Retrieved 14 September 2014. ↑ "Peugeot Plunges After GM Sells Entire 7% Holding". Bloomberg. Archived from the original on 19 February 2014. Retrieved 19 February 2014. ↑ Jolly, David (25 October 2013). "End of a Line Reflects a Weakened Peugeot". Archived from the original on 4 November 2017. Retrieved 1 May 2018– via NYTimes.com. ↑ Jolly, David (12 December 2013). "Investment From China May Be Near for Peugeot". Archived from the original on 5 November 2017. Retrieved 1 May 2018– via NYTimes.com. ↑ "PSA Peugeot Citroën announces major business and financial projects for the development and growth of the Group". FinanzNachrichten.de. 19 February 2014. Archived from the original on 22 February 2014. Retrieved 14 September 2014. ↑ FT 19 February 2014 "Lossmaking Peugeot confirms €3bn deal with Dongfeng and France By Michael Stothard in Paris and Henry Foy in London"
↑ "Partners Peugeot and Dongfeng to build fourth car factory in Sichuan". China News.Net. Archived from the original on 14 July 2014. Retrieved 3 July 2014. ↑ "Mahindra completes 51% stake acquisition in Peugeot Motocycles". 1 May 2018. Archived from the original on 6 August 2017. Retrieved 1 May 2018– via The Economic Times. ↑ Golson, Daniel (1 April 2019). "Peugeot Could Be Back in the U.S. Sooner Than We Thought". Car and Driver . Retrieved 1 April 2019. 1 2 3 4 5 "Peugeot 308, Car of the year 205 in Italy". Union Italiana Giornalisti Automobile dell'Automotive. Archived from the original on 9 November 2014. Retrieved 8 November 2014. ↑ "2009 Peugeot RC Hybrid Electric Concept Price, Specs & More". RSportsCars.com. Archived from the original on 26 April 2009. Retrieved 27 April 2009. ↑ Abuelsamid, Sam (3 October 2008). "Paris 2008: Peugeot RC HYmotion4". Autobloggreen.com. Archived from the original on 27 March 2012. Retrieved 27 April 2009. ↑ Abuelsamid, Sam (4 October 2008). "Paris 2008: Peugeot Prologue HYmotion4 diesel hybrid". Autobloggreen.com. Archived from the original on 27 March 2012. Retrieved 27 April 2009. ↑ "Peugeot Shows Two HYbrid4 Concepts, New BB1 EV Concept at Frankfurt". Green Car Congress. 15 September 2009. Archived from the original on 24 June 2010. Retrieved 31 May 2010. ↑ Pulman, Ben (10 September 2010). "Peugeot Ion (2010) electric CAR review". Car Magazine. Archived from the original on 31 March 2013. Retrieved 4 January 2012. 1 2 "Who is... Jean Todt?". Grandprix.com. Archived from the original on 27 March 2012. Retrieved 22 September 2008. ↑ "Peugeot - Season 1984". Juwra.com. Archived from the original on 16 October 2012. Retrieved 7 November 2012. ↑ "Peugeot 205 Turbo 16". World Rally Archive. Archived from the original on 27 March 2012. Retrieved 22 September 2008. ↑ "Victory and hat-trick of the 208 GTi Peugeot Sport at the Nürburgring 24 hour race". Peugeot Sport. Archived from the original on 9 November 2014. Retrieved 23 May 2013. ↑ "Motor Racing: Warwick on top of world - Sport". London: The Independent. 31 August 1992. Archived from the original on 19 September 2011. Retrieved 26 March 2010. ↑ "YouTube". www.youtube.com. Archived from the original on 5 August 2017. Retrieved 1 May 2018. ↑ "Peugeot reveals full spec of Loeb's 875bhp, 875kg Pikes Peak T16". AUTOSPORT.com. 23 April 2013. Archived from the original on 5 May 2013. Retrieved 14 September 2014. ↑ "875bhp twin-turbo Peugeot 208 T16". Autocar. Archived from the original on 28 May 2013. Retrieved 14 June 2013. ↑ "Peugeot Motorcycles". Peugeot.com. Archived from the original on 15 May 2011. Retrieved 2 May 2011. ↑ "Peugeot :: Scooters:: Accueil". Peugeotscooters.fr. 5 December 2009. Archived from the original on 5 October 2007. Retrieved 27 November 2010. ↑ "about us". Procycle. 7 April 1999. Archived from the original on 15 July 2011. Retrieved 2 May 2011. ↑ "Bicycles". Peugeot.com. Archived from the original on 15 July 2011. Retrieved 2 May 2011. Wikimedia Commons has media related to Peugeot .